A fact about my family is that we eat bunches of bananas. No, we don’t eat the bunches in one sitting, though I am guessing we could if challenged; but, we do eat several bananas a week. My youngest loves peanut butter, jelly and banana sandwiches. Yes, all three on one sandwich. Come to think of it, I don’t remember the last time he had a plain peanut butter and jelly sandwich. We put a banana in every smoothie we make, which we make daily. My husband takes a banana with him to work, while I eat a banana every day along with a mixture of raw tree nuts. Because we go through bananas quickly, I go to the grocery store to buy bananas and restock our supply, frequently. Oftentimes, during the week, my trips to the grocery store are quick, and I am buying five items or less. If I am buying ice cream, and only ice cream, it takes me less than 10 minutes; however, if I am buying bananas, it takes me more than 10 minutes … just to pick out the bananas. Recently, I walked into a grocery store for two items – just two items: ice cream and bananas. As I walked towards the produce department of the grocery store, I witnessed an amazing thing. A women wheeled her cart next to the bananas and stopped for a moment. She glanced at the bounty of banana bunches, immediately grabbed one bunch of bananas, and placed the bunch in her cart. Within seconds, she was out of the produce department. I stopped dead in my grocery cart wheel tracks. What just happened? I wondered. I shook my head and blinked my eyes. Did I just see what I thought I saw? How did she do that? How did she just go up to the bananas, pick a bunch, and wheel her cart away? I didn’t notice a super-hero cape on her. She looked like a normal human being, possessing no super powers. Sure, using my not so super-hero power of peripheral vision, I noticed folks walking up to the bunches of bananas and leaving with a bunch long before I had decided which bunch I wanted. Yes, using my not so super-hero power of hearing, I moved to the left or moved to the right as directed by the bunch of banana buyers, able to find their perfect bunch in an incredibly short amount of time. I stared at the bananas. Some bunches were green; some bunches were yellow; some bunches were heavily speckled; some bunches were lightly speckled; and, some bunches were not speckled but bruised. I moved to the left, allowing someone to grab a bunch. I moved to the right, allowing another person grab a bunch. I watched through the corners of my eyes, as bunches of bananas disappeared one by one, each taken by someone grasping a super power that escaped me. Twenty minutes later, I determined which bunch of bananas was the best bunch, and I continued on to complete the rest of my grocery shopping. To this day, I wonder how in the world that mystery woman picked out her bananas so quickly. Witnessing her super power was amazing. 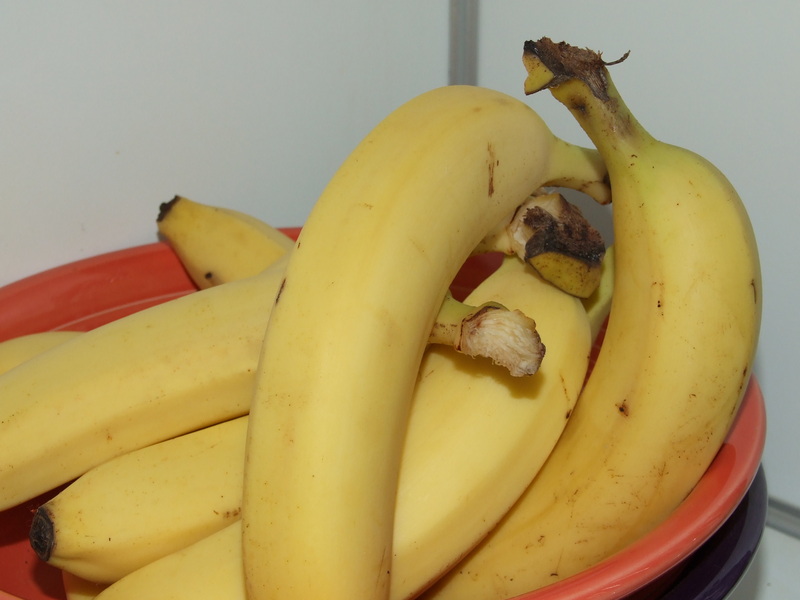 Banana Tip: Pulling the bananas apart from the banana bunch slows the ripening process. That woman you saw was me. In fact, my entire grocery-shopping tactic is “grab-n-go”. I hate hate hate (did I mention I hate it?) shopping. Jim loves to shop (I know, crazy) He’ll be the one inspecting each banana forever. We love bananas here as well. I just had one with strawberries in my oatmeal, thank god I didn’t drop the dish this time around. I loathe shopping, Darla. By the way the word ‘loathe’ beats ‘hate’, even when hate is used three or for times. I loathe shopping. Loathe. Actually, food shopping I don’t loathe – clothe shopping …. please. No. LOATHE!!! Likewise! It was a surprise and a delight to read this and imagine an alternate universe in which I painstakingly selected the perfect bananas. I tend to see something along the greener end of the spectrum, nab it and roll. Isn’t it wonderful how bananas bring folks together?! Even the littlest ones can join in the fun. Thank you for visiting, Deb. I wish I liked bananas. Next to apples, bananas are a near perfect fruit, encased as they are in their own neat little to-go wrapper, and they’re chock full of good things for us. But for some reason bananas have always triggered my gag reflex. I love ‘naners in a smoothie…it ain’t a smoothie without a ‘naner. My mom loved bananas. She often made peanute butter and ‘nanner sandwiches….but she also made peanut butter and bacon sandwiches. I wish I like bananas. My brother-in-law cannot stand bananas. Too many family trips as a kid – by car – where bananas were consumed on a regular basis in the car. Funny how you enjoy bananas in smoothies. I’m the same way with things – I won’t like it plain, but if it is chopped up and mixed with things, then I’ll give it a try and typically like it. Good banana tip! Now if you could only tell me how to find a perfectly ripe avocado, I’d be a happy shopper. Yes it does count, MJ. And, I’m with you on that – 100%. I am very picky when it comes to bananas. I have to buy them kind of green because I don’t like them when they have spots on them. I want them almost crunchy, not mooshy. If they start to get spots, I just throw them in the freezer and I’ll make banana bread later. I love real bananas in things, but I hate banana flavored things like candy. It never tastes right to me. Me, too, Amy. Obviously, eh – I mean it takes me 15 freaking minutes to pick out a bunch. I also love real bananas but banana flavored items is a whole ‘nuther story. I have a banana every single morning in my Cheerios. Love them. Occasionally I will slice up a banana on Noah’s PB sandwich but I don’t know if I’m allowed to do that now that he’s in middle school. I’ll have to ask him. I don’t do the banana picking because Hot Joe does the shopping BUT I do know they have to be somewhat green. Hot Joe just got hotter because he does the grocery shopping. The End. It takes me less time to pick bananas than any other fruit. Especially melons. You just can’t trust them! Amy and I would be fighting over the same bananas. I eat them until they are deemed no longer edible, then they go in smoothies. I spread pb directly on my banana for the first time yesterday. How did you know? I don’t think I’ve ever tried it on a sandwich. Thanks for the tip about separating them. So why do I have a banana holder on top of my fruit basket? I must rethink this. Spreading the PB on the banana directly is a wonderful idea. The bread takes away from the flavor, anyway. Yep, I will try this direct and simple combination. I am clueless on how to buy melons. I don’t care for melons, so I don’t buy them. Thank you for stopping by here. Ahh…”Ode to the banana.” Bananas! Just can’t buy enough of them…and if a few hang around too long, just turn them into banana bread. Wish cantaloupes were as easy as watermelons to pick out. I never know if they are luscious or tough. I try smelling them on top…they say if you get a whiff of fruit fragrance, it’s ripe…but still, like chocolates, I’m not sure what I’m going to get. More often, I deliberately choose an overripe one, to be sure it’s more juicy than not…and then make sure we eat it in a couple of days. Variety is good but you can never lose with bananas. I love our blueberries in the freezer from berry picking in May…so glad they are on hand for breakfast…pancakes, muffins and cereal. See … I don’t bake. I know the brown mushy bananas make good banana bread, but well – I don’t bake. My husband will still eat the mushy ones, though. Bananas are not tossed out in our house. No chance of that happening. As It old Patti, I don’t care for melons. Rob will bring watermelon and cantaloupe home sometimes. I guess he can tell what is ripe and what isn’t ripe. I have a bag of fresh picked blueberries given to us by Rob’s parents last year. It’s just one bag… and I am having a hard time letting it go. I need to use them, though. Rob could make some great pancakes with them. Mmmm… I like the sound of it. I love a pb and banana sandwich. And I’ve always heard Elvis loved his pb and banana sandwiches fried. Fried, eh? I may have to give it a try. PB and B sandwiches never disappoint. Ever. Maybe she got to the store early, stared for a long time at the bananas, getting every detail into a photographic memory, and then when you saw her – she just made for what she remembered?! I love bananas, they used to be my favourite fruit. I loved them fresh, loved them in milk shakes, ice lollies, baked banana, all sorts of things (even toothpaste! When I was a child there was a banana-flavoured toothpaste that I loved, though I suspect I ate a fair bit of it too… bad me!) Well, I say ‘used to be my favourite fruit’ but these days, when they are in season my faves are Sharon Fruit (aka Persimmons) providing they’re the kind that don’t make my tongue go furry. And I adore watermelon. Years ago – well, decades ago – there was a cafe in a local store that used to serve toasted banana and melted cheese sandwiches. It sounds odd, but they go really well together! I once thought a grilled apple and cheese sandwich was an odd mix, until I tried it. Delightful. Truly delightful. I am going to try a grilled banana and cheese sandwich this weekend. Blueberries and strawberries are my favorite. Add a banana to the two and it is a match made in heaven. 🙂 I’m not sure I’ve had a Persimmon. Oh, I like Kiwis, too. Thank you for visiting, Val. I do few things quickly. I have no desire to increase my speed in picking the perfect fruit. Though those fast pickers may distract and annoy me slightly…. maybe. I’m going with laser eyes or – as Val suggested – she scoped the selection earlier in her grocery shopping expedition. Then, she returned to the banana display and grabbed what she previously zoned in on. Thereby giving the perception she has laser eyes and keen fruit picking skills. Of course, I could be over thinking it. Nah. Love bananas. Love banana and pb sandwiches. Elvis did like them fried and I tried it. It was good. I kinda fancy mine up with natural, chunky peanut butter (I get a reduced fat kind with less oil) and whole grain bread, and thin layer of butter for the frying part, which I guess is really more just heating up rather than true ‘frying’. I’m also a picky shopper, so I’d probably be right there with you checking the bananas out. I don’t like them too big or too ripe, and I’ve got a weird thing about even numbers so I always have to try to find a bunch with four or six bananas. (I know, I know, I’m perfectly aware of how weird that is. But I just like things in even numbers, not just bananas. Is it possible to have just a mild case of OCD?) I’m a label reader, too. It sometimes takes me forever to do my grocery shopping. Luckily I kind of enjoy it. I also discovered that keeping the separated bananas in the fridge also prolongs the freshness. The skin gets brown a bit more quickly it seems, but the banana inside is fresh. Thank you, Leonore. I am glad you appreciated the fun. I truly was inspired by a trip to the store. The woman I wrote about seriously walked up with such speed. I couldn’t believe it. I’ll have to keep the bananas in the fridge and see how that works. The brown peel makes me nervous, but if the inside is fresh and tasty – then I won’t judge a banana by it’s cover. HA! Thanks (as always) for visiting. Um…Husband brings home bananas…I inspect bananas…LRHF peels ALL bananas when no one is looking…and then I end up just freezing them for baking anyway. This is the short version of “Bananas: Life with Us. Oh, epilogue: Banana peels go into compost–excellent potassium source in compost. Have you seen the Mythbusters where they test the comic spoof about slipping on banana peels? Somehow your description makes me think your house would be ‘ripe’ for slipping and sliding! This made me laugh! I’m the same, but with fruit such as peaches or nectarines. I touch them, prod them, squeeze them, inspect them, put them back, pick them up again a million times before choosing them! I am glad this made you laugh, Love out Loud. Moreover, I am happy to hear you share similar qualities when it comes to picking out certain fruits. No one else admitted such a quirk. (smile) Thank you for coming forward. I knew I wasn’t alone. My mother used to make my brother and I sandwiches made with a concoction of peanut butter, bananas, Miracle Whip and lettuce…I kid you not. As you can imagine, it was a completely mortifying lunch. It’s really the sort of thing you have to eat in the privacy of your own home with the shades drawn. She still eats them to this day. Frightening, I know. Wow, Nancy. I’m a bit – um. Wow. Maybe I could tell myself the mayo was really marshmallow creme, but the lettuce? Not sure how to spin that part. I feel a bit better knowing it was not something you liked. (smile) I’m not sure liking something such as a banana, peanut butter, mayo and lettuce sandwich should be admitted online. We always have bananas…they usually start to go bad while sitting on the counter, hence wonderful banana bread and muffins. When the kids were little, and would accompany me to the grocery story, I stuck the banana sticker on my forehead to make them giggle, then I would forget about it and it would be there the rest of the day. Welcome to the fruit aisle, MKultra! Good to see you here. I’m with you, Lenore. I’ve noticed that some bananas have a certain look that tells me they’re not going to do well on that journey from green to yellow. They seem lost, their color going off in the wrong direction. I don’t know anyone who understands what I’m talking about, but I think you might. I don’t like bananas that aren’t yet ripe, but I’d rather eat them before they become soft and speckled. I eat them plain, with peanut butter, or in cereal. I’ve never had them in a sandwich. Overripe bananas are perfect for cake, but it has to have cream cheese frosting. The grab-and-go people are weird. Especially Darla. You crack me up, Charles. “The grab-and-go people are weird. Especially Darla.” Too funny! And yes, I do understand what you are talking about. You describe it better by telling how their color is going off in the wrong direction … almost a pale yellow – it’s odd. Thank you for relating and understanding. I always appreciate your support.